Information about the comet that astronomer Klim Churyumov discovered almost 45 years ago helped the European Space Agency organize the Rosetta mission. The study of the Churyumov-Gerasimenko comet, now being carried out by the European Space Agency, will help us understand how life began on Earth. The project also includes the development of technologies that will send people to Mars and will study the possibility of changing the orbits of dangerous asteroids. The comet was discovered in 1969 by Klim Churyumov and graduate student Svetlana Gerasimenko. Churyumov spoke to RBTH about his discovery and about the Rosetta mission's significance for mankind. RBTH: How do you evaluate the Rosetta mission in the context of the Churyumov-Gerasimenko comet? 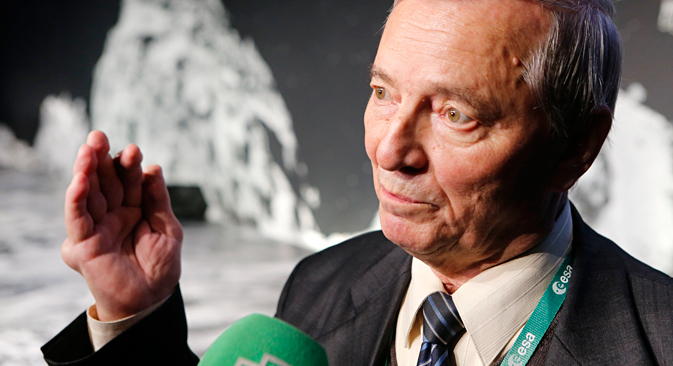 Klim Churyumov: The mission has still not been completed. We are waiting for the final results. But we can already say that it is a success. We have received detailed information about the relief of the comet surface when the space probe was still approaching the comet at a distance of 10 kilometers. Our European colleagues almost immediately made a model of the comet and gave us smaller copies. The biggest achievement was the landing of the Philae module on the nucleus of the comet. This is much more difficult than landing on Mars, Venus and other planets since there is more space there and the planets have heavier gravity. We thought we knew everything about the Churyumov-Gerasimenko comet. But when the module landed on the surface the harpoons that were supposed to keep Philae on the comet did not work correctly. RBTH: How could this have happened? K.C. : The module had been in space for 10 years. The sun's protons could have had the small knots and joints welded to each other. The Rosetta had constantly been assailed by solar wind. This could have affected the efficiency of the harpoon mechanism. Or Philae could have touched the surface with only one of its three legs, while the harpoons function, as a rule, when at least two legs land on the surface. In one way or another, because the comet practically does not have any gravity, upon lightly touching the comet the module jumped up 500 meters, then again touched the surface and again jumped off. It was possible to secure it only after the third attempt. A human being would have flown out into the comet's orbit after this, immediately establishing cosmic speed. After all the problems with the Philae's batteries we hope that they will start working in a normal manner. However, 80 percent of the objective has been accomplished. Aboard the Philae there are 10 precision instruments, with eight of them having worked. That is a great success! Thanks to this experience, in the future it may be possible to launch emergency missiles with nuclear warheads to counter dangerous asteroids that threaten Earth. RBTH: The newspapers wrote that in the 1960s you said that by studying comets mankind could find the answer to how life began on Earth. K.C. : Comets have complex organic matter. For example, in the tail of the Wild 2 comet they found glycine. Everyone knows that man cannot live without this substance; the brain and spinal cord can't work without it. It is now proven that the isotopic composition of ocean water is identical to the composition of water in a comet's nucleus. According to one theory, water appeared on Earth thanks to the fall of a very large number of comets on our planet. RBTH: What are you working on now? K.C. : I'm continuing my work on comet specters. We have accumulated tens of thousands of photos and video images taken by telescopes in the U.S., Mexico, Chile and Ukraine. Much already has been processed, but many of them will be studied by my graduate students in the future. Specters are like a comet's fingerprints. They all seem similar, but the patterns are very different. Modern telescopes give us images with 100 percent resolution. Today space telescopes have been able to penetrate such distances that we are able to see the edge of the Universe, including objects that came into being as a result of the Big Bang that occurred more than 13 billion years ago. RBTH: Several legends exist about the Churyumov-Gerasimenko comet. How did you actually discover it? K.C. : We understood that we had discovered something a month after our observations. We had been observing other objects and discovered the new comet simultaneously on five plates. Four of them had the comet at the edge of the image and one in the center, because we had made a mistake: we had focused the telescope incorrectly. We first thought that the comet was a defect of the photographic plate. Astronomer Nikolai Belyaev, who is now a prior in a Russian monastery, calculated the exact orbit. Then we sent a telegram to all of our colleagues throughout the country. When they programmed the coordinates and saw the comet, they replied, saying that the discovery had been recognized and the comet would be named after its discoverers. RBTH: Are you still in contact with your colleague Svetlana Gerasimenko, with whom you discovered the world-famous comet? K.C. : Of course. We constantly exchange e-mails and talk on Skype. I flew to her conference in Dushanbe, which was dedicated to new discoveries. She gave me a very beautiful oriental scarf.